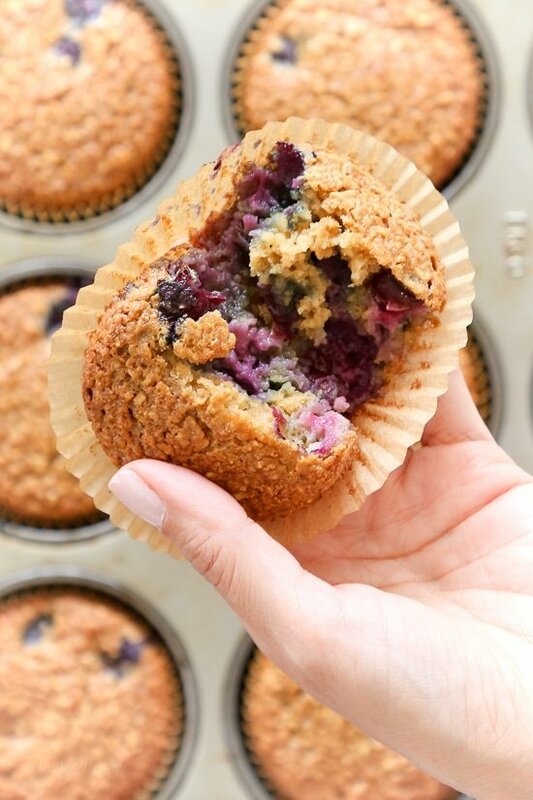 These Gluten-Free, Dairy-Free, Blueberry Oatmeal Muffins are insanely good. So moist, and lightly sweetened, studded with blueberries in every bite! A cross between baked oatmeal and oatmeal muffins, if that was a thing! Made light by swapping out some of the butter with apple sauce and using less sugar than most muffins would call for. You can swap the brown sugar for coconut sugar, and leftovers freeze and reheat well. I’ve been craving these muffins, which I’ve made so many times before with wheat flour, but I wanted to create a gluten-free version so I could share them with my aunt. I thought it would be as simple as swapping out the flour for gluten-free flour, but after testing them out, they needed a little extra flour, so I figured I would share this as a new post. The nutritional info is also slightly different because of the extra flour. If you don’t need to make them gluten-free, I suggest you use these directions instead. 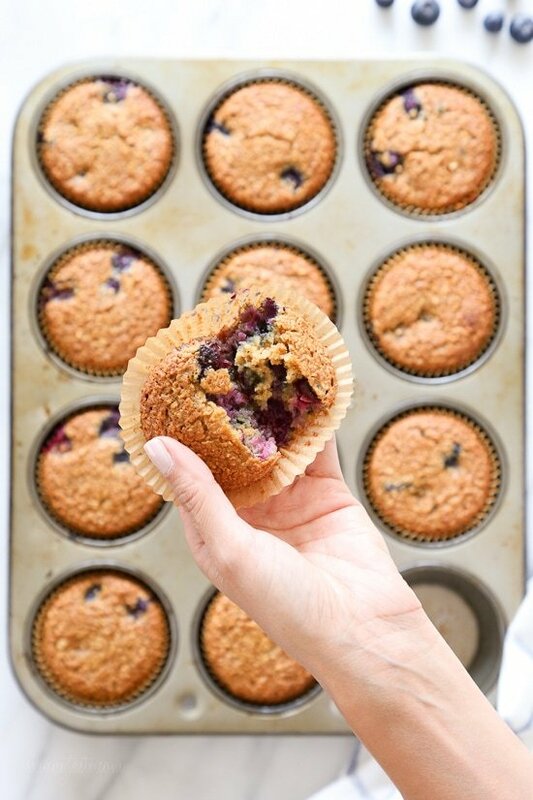 These Gluten-Free, Dairy-Free, Blueberry Oatmeal Muffins are insanely good. So moist, and lightly sweetened, studded with blueberries in every bite! Preheat oven to 400°F. 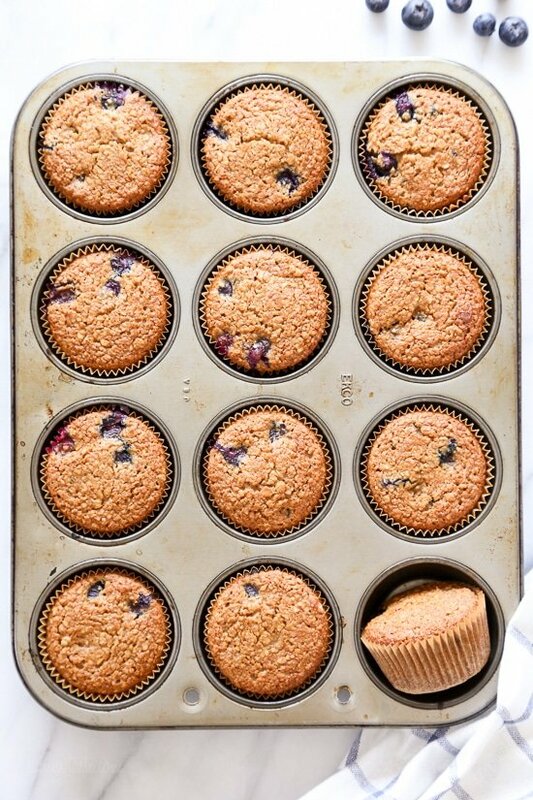 Line a muffin tin with liners and lightly spray with oil. In a third bowl combine flour, salt, baking powder, baking soda and whisk to combine. Spoon into the muffin tin and bake for 22-24 minutes. Enjoy!! These muffins were really good!I made some substitutions based on what I had and I think it worked :)I used cows milk instead of almond as that’s what we drink. I also didn’t have any brown sugar left so I used the coconut palm sugar 1:1 but slightly less than 1/4 cup. I also was making these for my toddler so used “just add water” kind of baby oatmeal cereal for added iron. Finally I had frozen blueberries. I think that’s what made me have to cook them a bit longer. I made mini muffins. Cooked for 20 minutes. Next time I’ll try a bit less than 1 cup milk,Loved them! Excellent! I will use silicone liners in the future as these stick to paper liners really badly even with a heavy dose of cooking spray. Really good. Sprayed the liners, but still stuck pretty badly. I’ll be more diligent next time. A keeper!! These are so moist and yummy! Easy to make, too. 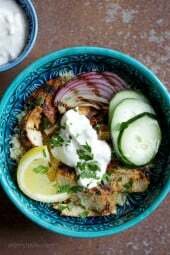 Love the recipes that I have tried. You have a great website! My muffins look amazing, but they’ve been in the oven for about a half hour and are still failing the toothpick test! Is the toothpick supposed to be completely clean? Or are they supposed to be gooey? Can I substitute Stevia brown sugar blend for the brown sugar? I just made these using 2 ripe mashed bananas in place of the applesauce. Really good! I got 14 muffins. Excellent! My kids and husband could not save any for the next day. I like how the oats were soaked in milk. I will use that for other recipes. These are the best GF muffins I have ever had. I have had Celiac for 10 years, and I love muffins.I used King Arthurs GF flour instead of Bob’s Red Mill, and regular 2% milk.Finally, a moist muffin. It is going to be hard to not eat them all this afternoon. I recently began cooking gluten free for my daughter and I found these muffins to be delicious and the whole family enjoyed them! I added in a few fresh raspberries too which were a nice pairing with the blueberries. Thanks, Gina! Hi! Are freestyle points the same as smart points? All the smart points have been updated to reflect the freestyle program. These are very moist and lightly sweetened so perfect for breakfast. However I feel like there’s is a weird aftertaste. Could it be the flour? I used what was recommended but I’m also new to gluten free diet. Any suggestions to get rid of this? These are not dairy free… Eggs and milk are dairy… ? This recipe calls for almond milk, also eggs come from chickens not cows. Is there something that I can use to sub for the eggs or liquid egg substitute? I made these muffins about a month ago. They are delicious. I’m thinking about adding strawberries instead of blueberries because I don’t have blueberries at home. I hope the muffins will turn out just as amazing! These look delicious. I can’t wait to try them this weekend. 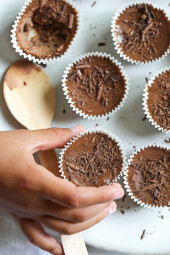 Can I make these with almond flour instead of gluten free flour? I’m confused about these being call vegan–the recipe calls for eggs and honey??? These muffins were delicious. So easy to make. Thank you for the recipe. Do you have recommendations for a substitution for the apple sauce? These are delicious and super easy to make. I messed up and followed the gluten free recipe with regular flour. They still turned out great! Absolute BEST gluten free/dairy free muffins EVER!!! Thank you so much for this receipe. Meilleure recette de muffins sans gluten/sans produit laitier que j’ai mangé depuis longtemps. A essayer!! do u bake at 400 too?? Can i use anything in place of the oats? Hi. I’d love to try this recipe. Would oat flour work? I hope so. Thanks. Sorry for the loss of your dad. How much butter if you aren’t using applesauce? These are so yummy! Easy to make and kid friendly! These are awesome! Thanks sooo much! Could I replace the sugar with Stevia? Wow!! I have not tasted a better gf Muffin in the six years since my celiac diagnosis. These are scrumptious! Thank you so much for not forgetting about those of us who have to be gf! You outdid yourself on this recipe! I’ve made these twice now and each time they’ve been amazing! I lactaid milk instead of a nut milk because of allergies and it works perfectly. Not to mention, they’re ridiculously easy to make. Glad you enjoy them Emily! This recipe was a wonderful healthy treat for Christmas Eve morning! It is destined to become a family favorite. I did not have instant oats so I used Bob’s organic oats and added 1/2 cup extra almond milk. Did not have gluten free mix so substituted whole wheat pastry flour (1 cup). Delicious! Do you have any substitutes for brown sugar? (Not Splenda). Like a natural sweetener – maple syrup, honey etc. Hi, would almond flour work as a sub for the Bobs Red Mill Gluten Free All Purpose Flour?? My guess is yes but I didn’t test them. Let me know if you do! Can I use an egg replacement? My grandson has an egg and dairy allergies. Looks great! Would Almond Flour work instead? Did you try this? Did it work? That’s my problem too! Fresh berries are out of season so they’re even more expensive- broke college kid here! 😉 I’m interested to hear how yours turned out! Excellent recipe. My husband said there were the best blueberry muffins he has eaten. Excellent recipe. My husband there were the best blueberry muffins he has eaten. Great recipe. thank you. my kids keep asking for more! So yummy! I loved that they were not too sweet. I used unsweetened cashew milk since that’s what I had. My muffin tins must be smaller than yours. Ended up making 18 muffins (97 calories a muffin). Thanks for another great recipe! Our currants were ripe so I used them in half the batter, while the other half were blueberries. These were absolutely delicious! For the past 1 1/2 years I’ve only used skinnytaste recipes. This was one of the best! Love your recipes but these didn’t work. Seemed like too much milk, not enough flour. Can I use straight coconut flour to replace the gf flour? Or oat flour? What do you mean by soak the oats? Soak them in the milk you use so they soften before baking. How did I miss this new GF recipe?!?! I’m going to make it now. Thank you for sharing your GF recipes!! I only have almond flour or coconut flour. Would those work? Hi Gina, I plan on making these muffins tonight. They look delicious! I just have one question. Can I use Bob’s Red Mill Gluten Free Old Fashioned Rolled Oats? Or would it throw of the consistency/cooking time. Thank you! 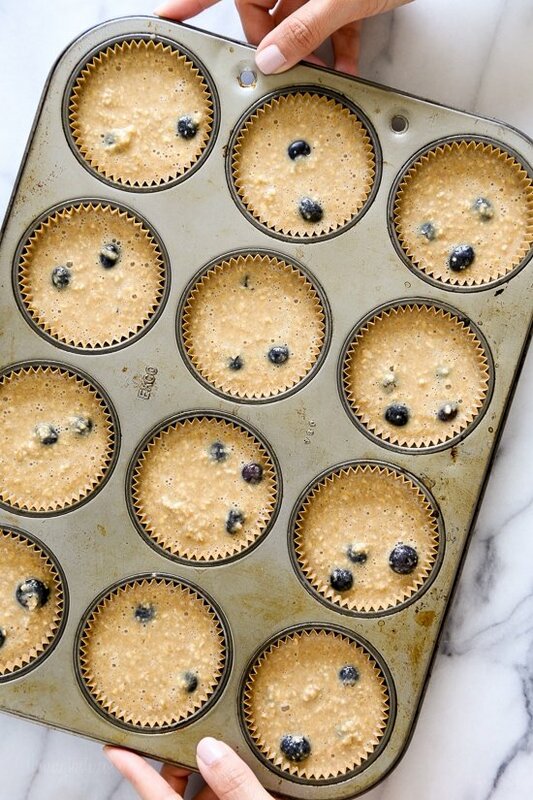 I plan on making these muffins tonight. Can’t wait! I just had one question would these be ok with Bob’s Red Mill Gluten Free Old Fashioned Rolled Oats? Or would they throw off the cooking time/consistency? Thanks! Hello. What can I use to substitute the apple sauce? I was diagnosed with my gluten-sensitivity in November and have been adjusting to the gluten-free life. I can’t wait to try these muffins! Thanks for the post! I made these and somehow ended up with 19 muffins instead of 12. I used all the correct measurements and ingredients. How do I adjust the points value? Can I freeze them after they are baked? Should I warm them up when defrosted? Can u make this in a cake pan? You can though I am not sure on timing….do the toothpick test. I just made these Gina and subbed the flour for a gluten free flour blend. They came out fantastic! Thank you for your dedication in continually providing us with healthy and tasty recipes that are fool proof! I so appreciate you!! I need to make this low carb, low fat & choleterol friendly. So I would use egg beaters\egg whites, Splenda or Splenda brown sugar blend (I think it is, or just splenda) maybe substute for other ingredients if needed. Will this still work with all the substitutions? Can you suggest any other substitutions? They are already low fat and low cholesterol with the egg whites! There’s really no way to make them low carb though since they are grain based. You could try using almond flour to make it lower carb, but I don’t know how that would effect the recipe. My youngest son, who has several allergies, has been asking for muffins for a long time, so I think this recipe would be great! One question: can I substitute something else instead of egg whites? He’s allergic to egg. Do you know if these freeze well? I’d like to make a catch for my 84-year-old mother. Thanks. Can this recipe be baked without the muffin tins, used as a loaf or square bread? If so, how would the baking time vary? Yes though I am not sure on timing….do the toothpick test. These look really good, and I would like to try them out. But I have one question. If you do not need a GF item, could you substitute with regular oats and all purpose flour? If you don’t need GF, could you just use regular all purpose flour? Thank you Gina! If I’m allergic to almonds, can I use coconut milk? These look great. Can I ask why you only use the egg whites? And would regular oats work? Thanks. Keeping them lighter but whole egg would work. Regular oats would work as they are the same thing. Can I use coconut or hemp milk instead of almond milk? Thank you, thank you for using Bobs Red Mill GF all purpose flour in so many of your recipes!! 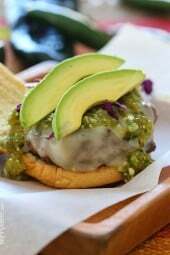 It taste great, is always easy to find and is reasonably priced at the market. It sure beats having to have an assortment of GF flours on hand at all times. Thank you for all the GF recipes you have made available, we that can’t eat gluten really appreciate your efforts to create great tasting things that don’t have gluten in them!! Keep up the good work???? You have the best recipes Gina. This looks amazing. Love watching your Instastories, your work is inspirational. I saw the email you shared that a reader left you. Can you use milk in place of the almond milk? Can you use soy milk instead of almond? We are diary free but I don’t like almond milk.